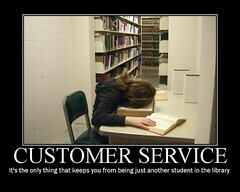 Customer Service:It's the only thing that keeps you from being just another student in the library. I think this just about says it all. The customer service training was a brief refresher of basic ideas that everyone knows. The rest of the time was used to ask the student assistants for info and opinions on the library. It was a neat chance to talk to them. They also all appreciated the humor contained in the workshop. It's nice to know that my favorite-customer-service-library-video-clip-of-all-time (tm) still has a punch. Nothing shows bad customer service like the librarian who gets frustrated when Cookie Monster asks for cookies. I was also glad to be able to say that you can get both cookies _and_ milk in our library cafe. (Sometimes even the vending machines have cookies).